Oh, Great Pharaoh, god-king, rise and harken to your subjects’ call! Horus Mighty Bull, Arising in Thebes, He of the Two Ladies, Enduring in kingship like Re in heaven, Horus of Gold Powerful of strength, Sacred of appearance, He of the Sedge and the Bee, Enduring of form is Re, Son of Ra, Thutmose, beautiful of forms, your reign shall be fabled. Take your place as the great god and master of the Egyptian empire, and share the wealth of the world among your loyal subjects. Bring the seasons and be the very sun in the morning. At noon shed your rays upon the world and bring the heat that makes the crops grow strong in all the vast fields along the life-giving Nile. 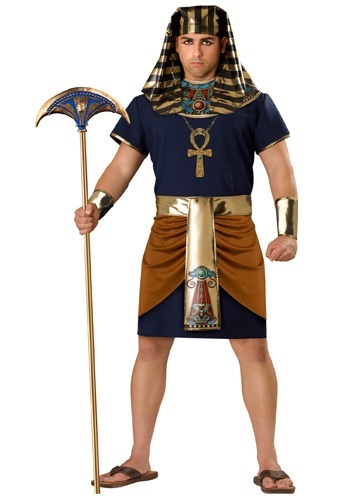 All these things and more will be exclaimed to you, great leader, upon donning this exquisite Plus Size King of Egypt Costume. Your subjects, no doubt awed by your magnificent magnanimity, will immediately begin construction upon a gigantic, titanic, megalithic pyramid, one that would dwarf even the great tomb of Khufu at Giza. Even the gods themselves will be jealous of your Plus Size King of Egypt Costume. The navy blue tunic has the printed ankh of resurrection and the gold edged sleeves of Egyptian royalty. The gold printed sash with Egyptian designs matches the gold cuffs and the stylistically impressive hood perfectly, such that all you meet will bow to you as the true king of Egypt. Hail the god-king, son of Ra! Nice fit, needs better belt attachment. The costume fits well, but the belt needs a Velcro attachment in the middle of the front on the tunic about six inches below the printed Ankh. This would keep the belt from slipping down. Instructions for the head piece would also help. This costume was a huge hit. It was made well. Voted best costume from judges at my work. I bought this for my husband for a Halloween party. He looked great. Quality was good. I purchased the cleopatra costume. We got many compliments. Super glad I ordered.